Ever heard of magnetotactic bacteria? These bacteria exist in the environment but orient themselves along the Earth's magnetic lines, meaning they can accurately follow the magnetic field. Here are a bunch of them in a storage container; notice how ALL of them move together as the magnetic field is reversed from the outside of the container. Why does this happen? 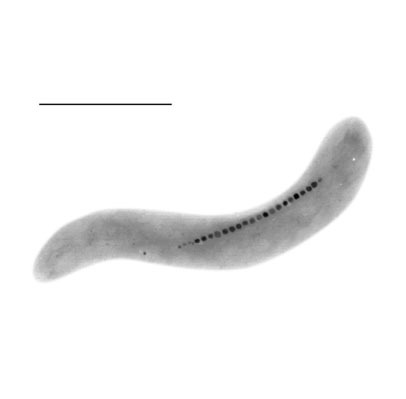 Let's take a look at one of these critters (on the right), Magnetospirillum magnetotacticum. Notice the line of beads present in the bacteria? These beads are called magnetosomes. They're basically iron mineral crystals that exist in each bacteria and magnetize the bacteria so it responds strongly to any magnetic field. To recap, these magnetosomes guide these bacteria along the Earth's magnetic lines. We can liken them to a bacterial GPS. This week, we're looking at the age-old concept of antardrashti, and we're asked to present this concept in an unique light - as our GPS. Basically, introspection is our GPS to orient ourselves on the path to success - be it both in and out of Satsang. The examples provided in the presentation, including the prasang of Govindanand Swami help us understand and grasp the importance of this concept. To drive the point home, we can refer to this month's issue of Nilkanth and the article entitled, "Analyze Yourself," provides us with a specific way on how put antardrashti into action - the perfect framework for an activity. Collect - Have each individual list one precise activity that they wish they could be better at in Satsang (e.g. reading Vachanamrut daily, singing chesta) or school (e.g. daily reading, regular SAT prep). The keyword is precise; vaguely worded activities, like "improving samjan" or "better grades," defeat the purpose of the activity. Analyze - Now ask individuals how they measure whether or not they do that activity. In other words, how do we keep track of our progress towards that activity? Most likely, they won't have anything, so use the article to give examples of ways they can record and keep track of their progress & regress (e.g. schedule, checklist). There are plenty of sites out there to help us keep track of goals, like Joe's Goals or even Remember the Milk. Act - Finally, it's now up to everyone to make their plan of action happen. Emphasize that only through regular upkeep will we accomplish our activities, meaning that skipping around won't accomplish what we sought out to do. ...regular upkeep will result in improvement. In short, we have the resources and know-how. It just now depends on how fast we let the GPS recalculate our path to align with Satsang.